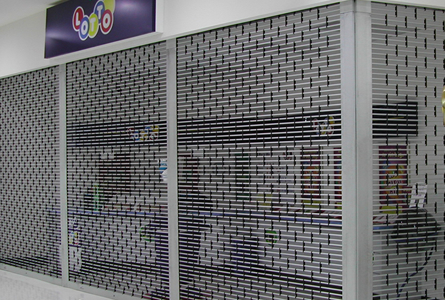 Roller Grilles may be applied to almost any type of existing or new openings with a degree of concealment not available in any other type of product. Suitable applications include: shopfronts, malls, arcades, bar and reception counters & closing off areas to public access. Door sizes are made to order and are not limited to standard sizes. Horizontal 12.7mm aluminium tubes connected by Nylon links into a brickwork pattern. Screen rigidity is increased by incorporating 3 tubes per row of links, Nylon end caps prevent metal on metal contact in door tracks, thus making operation quieter and extending the life of the door. Extruded Aluminium Section concealing 2 way double sided deadlock and allowing keyed access from either side. Locking can be positioned off centre if requested to avoid obstructing tills, posts etc. Extruded Aluminium channel 25mm wide x 50mm deep, fixed conventionally behind door jambs or recessed into wall. Flared at top for smooth entry at screen. 200mm diameter door drum for minimal defection of door screen across opening. Torsion springs calculated to balance screen weight for lightweight operation. Removable mullions are used to separate multiple doors in cases of very wide or angled openings when full access is required. The door tracks being removable leaving opening unobstructed. Satin Silver Anodised Aluminium. Powder coating of a wide range of colours available as an optional extra. Maximum recommended size for manual doors is 4000 wide x 3000 high. Contact us for recommendations over this size. Interested in ATLAS 12 Aluminium Roller Grilles?